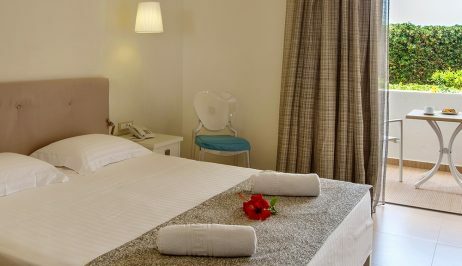 Iperion Beach Hotel is situated just among the sea , the sun and the modern-designed rooms and maisonettes . This place was born to be your home away from home. 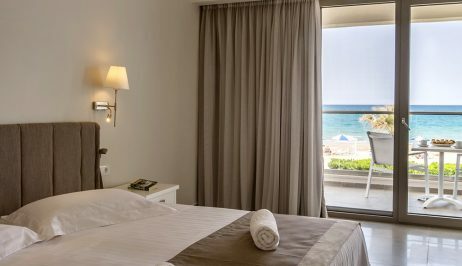 The unique location of the hotel in combination with the authentic hospitality of the staff and the minimal rooms create the ideal conditions for the most relaxing holidays in Rethymno. We are looking forward to welcome you at Iperion Beach Hotel and give you even more reasons to visit us again and again. 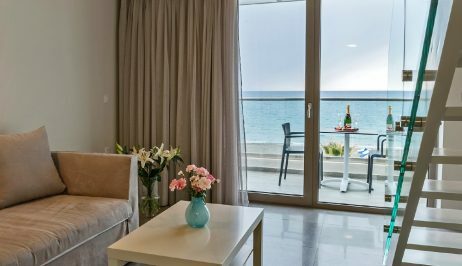 We suggest you to start your escape from the Superior Studios with the best sea views. In Our modern rooms the incomparable hospitality meets the peaceful and minimal atmosphere. Our aim is to offer you a continuous care while you experience an unforgettable comfort and rest next to the sea. Superior Studios can accommodate 1-3 persons. In addition, you can choose to stay in one of the Standard Studios. With their light tones they provide you the sense of tranquility among the gardens. You will experience together with your beloved ones to unforgettable moments. Standard Studios can accommodate 1-3 persons. Maisonette is the superior choice for the ones that are searching for magical panoramic views to the Aegean Ocean and the sunset together with family or friends. Discover the oasis of relaxation in one of our modern Maisonettes and let the splendid views amaze you. Maisonettes can accommodate 1-4 persons.